For quilters and sewers that need extra support for their quilts and sewing, the model 810Q is a great choice. While it has the wider cabinet design that accommodates the larger quilting, embroidery and sewing machines like the 810 cabinet, the 810Q has an extra fold-up (or down) leaf to instantly extend the surface right where it’s needed – in the back. Need more surface area? Add the Options Quilter's Extension (#1570) to the front or back of the 810 or 810Q. Still need more surface area for the model 810? Add the optional (#817 back drop‐leaf). A very popular choice! Sylvia Sewing Furniture is the only furniture manufacturer that designs and manufactures modular furniture. This allows the perfect combination of cabinets and storage chests to be created for today's quilter and sewer. Begin with one piece of furniture and add drawer stacks for a variety of combinations. Some cabinets even have an optional Quilter's Extension for extra surface area. 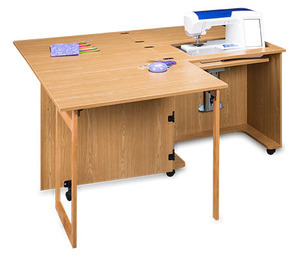 Integrate your workspace with Sylvia Sewing Furniture. Sylvia Sewing Furniture is the only furniture manufacturer that designs and manufactures modular furniture. Our sewing furniture allows you to sit centered in front of the needle for accuracy and sewing comfort. Let the 3-step patented Rudersburg Hydraulic Lift effortlessly raise or lower the sewing machine or serger for ease of use. Flush-mounted hinges will never snag your delicate fabrics or large quilts. 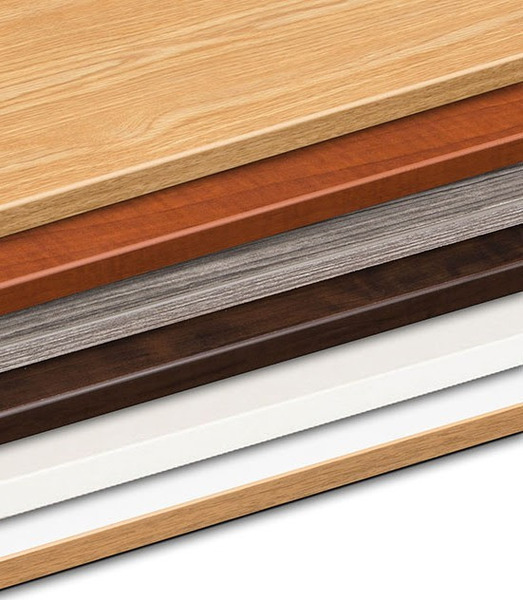 Solid Construction - Our glued and doweled construction provides strong, tight joints for years of trouble-free sewing and oversize steel-sided drawers protect your supplies. Our furniture has gently rounded edges and corners that are durable and smooth to the touch with a distinctive look. The extra thick top and base of our products give strength and stability, and cabinets fold away to protect the machine. Easy to Use, Easy to Move - each model has Commercial-grade locking casters (wheels) for easy movement and positioning. Sylvia sewing furniture comes with a Lifetime warranty, and is fully assembled with the exception of the wheels. I thought that the shipping price was a bit spendy but am very happy with the table. It more than meets my expectations. Thank you. John Douthat assisted me in getting the right cabinet for my sewing machine and prevented me from ordering the wrong one. I think he is a great asset to your company because we seldom get someone that provides excellent customer service. I order many things online and he is the first to give me such great service. Please "thank" him for me because the wrong cabinet would have created numerous problems, as well as additional money. The first cabinet arrived damaged and I requested assistance,John had a new cabinet shipped which has arrived in perfect condition. Thanks again! I would highly recommend your company to anyone and everyone!